Bird brain-eating Mantis - how does it crack the skull? The New York Times' Science article Birds Beware: The Praying Mantis Wants Your Brain is a good read and is well researched. Apparently the larger Mantises have been documented to occasionally kill and eat (parts of) birds on six continents. The mantis was clinging with its back legs to the rim of the feeder, holding its feathered catch in its powerful, seemingly reverent front legs, and methodically chewing through the hummingbird’s skull to get at the nutritious brain tissue within. “It was staring at me as it fed,” Mr. Vaughan said. 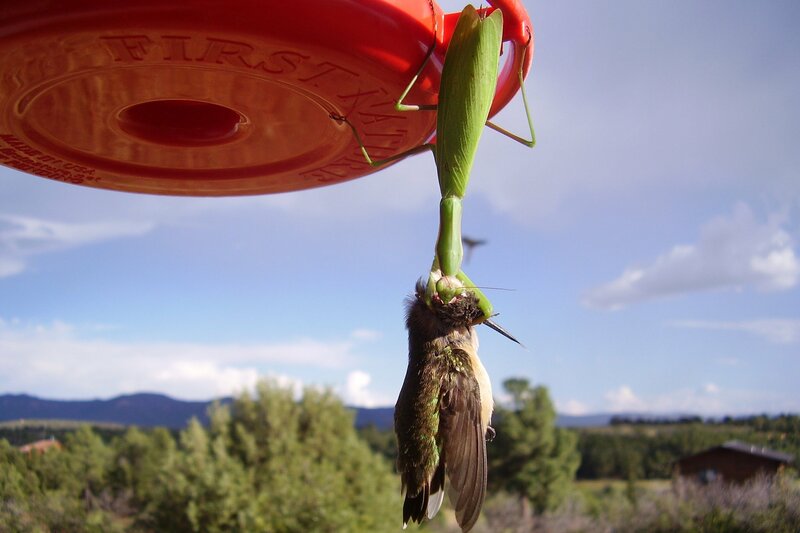 “Of course, I took a picture of it.” Startled by the clicking shutter, the mantis dropped its partially decapitated meal, crawled under the feeder — and began menacing two hummingbirds on the other side. James V. Remsen of the Museum of Natural Science at Louisiana State University and his colleagues documented 147 cases of mantis-on-bird predation in 13 countries representing all continents but Antarctica — not surprising, Dr. Remsen said in an interview, since there are no mantises on Antarctica. Hummingbirds were the most common target, but mantises also went after warblers, sunbirds, honeyeaters, flycatchers, vireos and European robins. Large species like the Chinese mantis, which grows to four inches in length, were the most avid avivores, and females were responsible for virtually all the bird-killing observed worldwide. In two reported cases, females feasted on birds while copulating with males. Sometimes the mantises would tuck in through the bird’s breastbone, but more often they went for the head, Dr. Remsen said. Question: How does the mantis break through the skull? I'm guessing it is smooth and much larger than the insects mouthparts, so it can't crush it. Does it cut through somehow? Or maybe go in through the ear? (Yuck!) 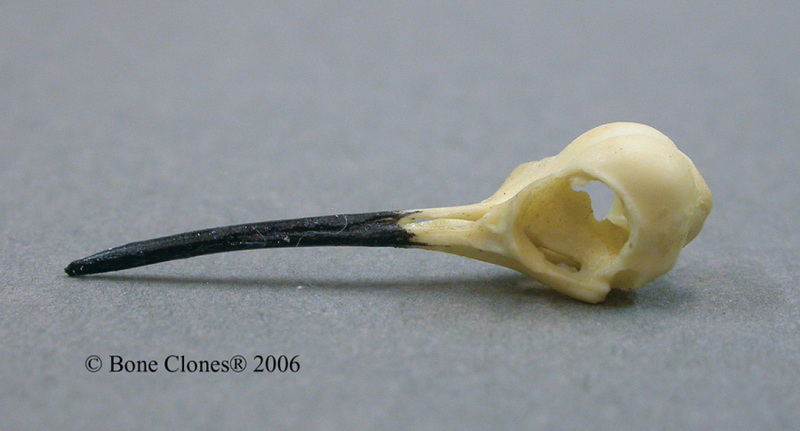 What "tools" does the mantis have at its disposal to break through a bird's skull? The mantis doesn't need to crack the skull to eat the brain. It can get to the cranial cavity through an easier way: the eye socket. 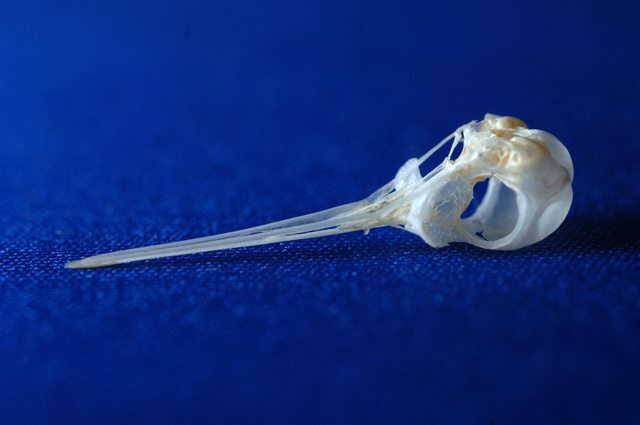 If you look at the image you shared you can see that the mantis' mouthparts are positioned at the side of the hummingbird's head, which corroborates the claim that the mantis uses the eye socket to get to the brain tissue. Nyffeler, M., Maxwell, M. and Remsen, J. (2017). Bird Predation By Praying Mantises: A Global Perspective. The Wilson Journal of Ornithology, 129(2), pp.331-344. Bigas, D., J. Piccardo, And J. L. Copete. 2006. Praying mantis killing passerines in mistnets. Dutch Birding 28:237–238. Not the answer you're looking for? Browse other questions tagged entomology predation or ask your own question. Why are bees eating the wax? How does mineral oil kill a cockroach?